A local bat sanctuary is changing the way we look at bats — in a live-cam, virtual way — with the Flying Fox Cam. Lubee Bat Conservancy’s live camera is mounted in one of the bat houses and showcases large fruit bats interacting with one another, and the bats have a growing fan base. 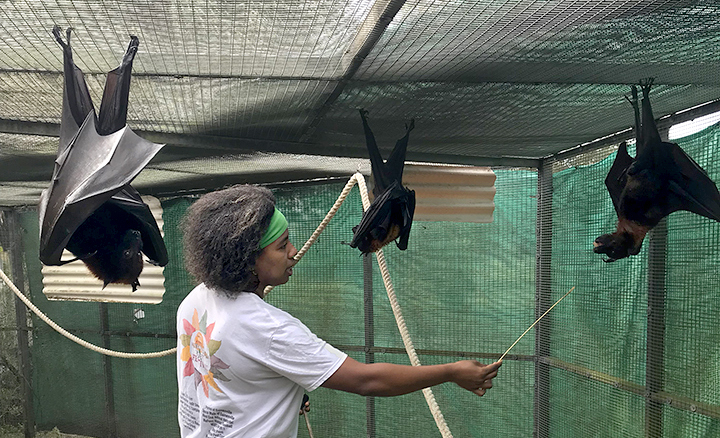 Lubee Bat Conservancy is one of the largest operating bat sanctuaries of its kind, said Dee McBride, development coordinator and bat keeper for Lubee. She said bat-loving employees and volunteers work to maintain a safe haven for some of the most threatened mammals: bats. Viewers can watch Grace, a Rodrigues flying fox, and Kuri, a Spectacled flying fox on the live camera 24/7. McBride said Grace and Kuri are their celebrity bats because of their constant screen time. Lubee, at 1309 NW 192nd Ave., began in 1989 by Luis F. Bacardi as a center for endangered animals, and three years later, Lubee became the fruit bat conservancy, McBride said. Bacardi was a family member of the Bacardi Rum founder, making it a little clearer as to why Bacardi Rum has a fruit bat in the logo. The endangered species list includes 77 bat species, with at least half of all bat species that are threatened and vulnerable, McBride said. Bats colonies in Australia are dying by the thousands, including a colony of Spectacled flying foxes that were 4,000 strong just decreased to 300. “They’ve been endangered — it’s just that now people are caring,” McBride said. Another goal of Lubee’s is to debunk the idea that bats are rabies-ridden and “evil,” said Amanda Ramage, education coordinator at Lubee. Out of almost 1,300 bat species, only one half of one percent carry rabies. 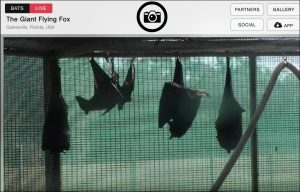 The Flying Fox Cams were installed in the bat habitat and went live on Nov. 27 through a partnership with Explore.org. Ramage credits the Flying Fox Cams and social media for changing the perception of of bats. “Before Wikipedia came along, if you saw a Malayan flying fox coming at you, you would think the devil had come for your soul, so I get it,” she said. Lubee’s online presence and outreach also allow for potential donors, which relies heavily on funding support to keep their program alive, Ramage said. Lubee has multiple student volunteers and interns that get to experience what it’s like to take care of bats, and most of them end up enjoying the labor of love, said Becky Jasperse, the records coordinator at Lubee and past volunteer. “We all kind of just fell into the position and then fell in love with bats,” Jasperse said.